Tilapia are native to Africa and the Middle East and have been widely introduced around the world for food production. They are abundant in many Mexican lakes, where they were introduced and are commercially netted by the hundreds of thousands, and are found in some southern U.S. waters, most notably Florida. Perhaps the most well-known member of this group is the Mozambique tilapia (Oreochromis mossambicus), which has been widely cultivated in ﬁsh ponds. 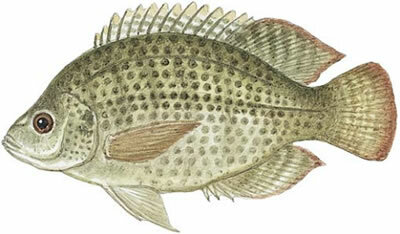 The tilapia is generally small with a moderately deep and compressed body. It has a long dorsal fin, the anterior of which is spiny; a single nostril on each side of the snout; and an interrupted lateral line, which may be in either two or three parts. It is distinguished from the bluegill by the absence of a dark blue or black opercular flap. In freshwater, they are primarily algae and plant feeders. Many are mouthbrooders, although some build spawning nests, which they guard after the eggs hatch. Most are small, although some reportedly can grow as large as 20 pounds, and they are schooling species. Despite their abundance, tilapia have little to no sport-ﬁshing value in most areas where they have been introduced, although they are valuable food ﬁsh. Tilapia have had mixed value in some areas where they have been introduced, crowding out some native species, stunting and breeding rapidly, and sometimes producing large crops of very small individuals, but also providing forage for larger predators, especially largemouth bass.